I was very excited to read this morning that someone is finally publishing a book on the legendary French decorator, Jacques Grange. And not just anyone, Editions du Regard is the same publisher that brought us the original monograph’s of Jean-Michel Frank, Emile-Jacques Ruhlmann, as well as the now out of print and incredibly rare and expensive work on Eugene Printz (despite the price tag, I am still longing to get my hands on a copy). Written by Monsieur Grange’s life partner, and sometime collaborator, Pierre Passebon, it’s due out in September – and I will certainly make sure I get my hands on a copy. I love the look of this place – I think I could move in right now and not change a single thing! J’dore this bathroom! It’s absolute perfection – but then what else you expect from Jacques Grange!? All images from “The Mark Hotel” website. I’ve been holding onto these tear sheets of this chic London home for quite some time, so I thought I would finally share them with you all. 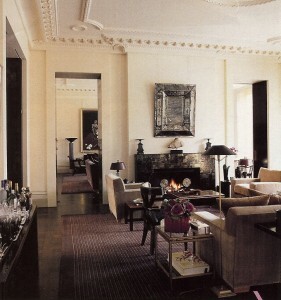 The owner is a very stylish Valentino executive who also has houses in Paris and Rome. 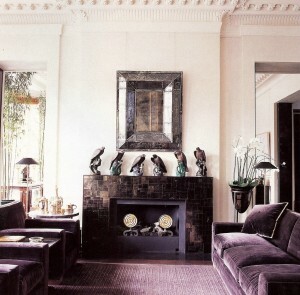 He has a seriously enviable art collection, and had the assistance of Jacques Grange decorating the place, which helps! The above two images are of the drawing room. 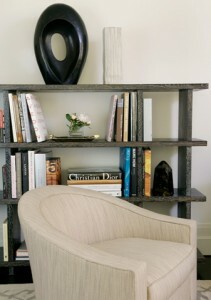 I love this colour combination, it’s so sultry and also looks very comfortable. The fireplace surround is Indian mica, with a c. 1700 venetian mirror above. 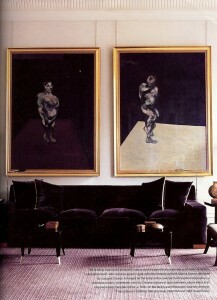 The two paintings above the aubergine velvet sofa are by Francic Bacon. I love the side tables, you can find similar ones from EJ Victor. 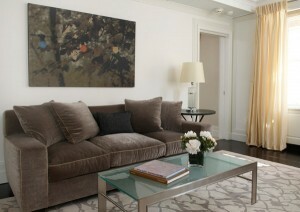 Taupe velvet covered sofa in the second drawing room. 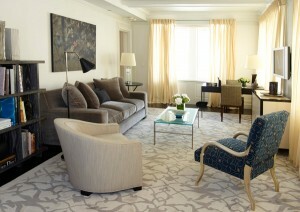 The rug (same design as before) was designed by Jacques Grange. 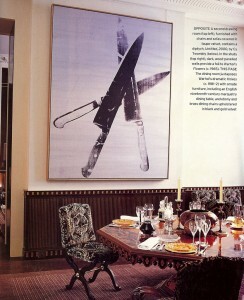 The diptych above is by Cy Twombly. The dining room has more of a mix of styles – English 19thC marquetry dining table teamed with ebony and brass chairs covered in black and gold velvet. An Andy Warhold piece takes up most of the wall space and provides a contrast. Above two images are the main bedroom. 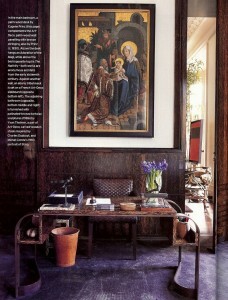 The Deco era palm-wood panelling beautifully compliments the Eugene Printz desk. The paintings are both anonymous works from the 16thC. I love how warm and masculine this room looks. And I love a bedroom with books. 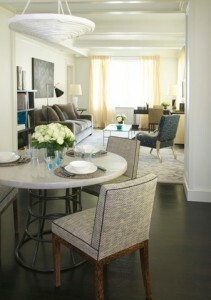 The guest bedroom is lined with linen and has a much more neutral palette. The artwork above the bed is by Philip Taaffe. 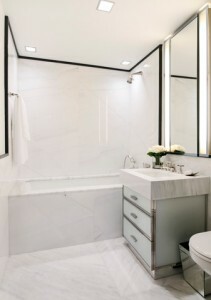 Love, love, love this bathroom!! I think its because it is slightly industrial looking to me, with the large windows and stainless steel framed cabinetry – I must be onto something here, it reminds me of a Glenn Gissler kitchen from a previous post. I really love how light it is. So chic! All images from House & Garden (UK edition) January 2006.